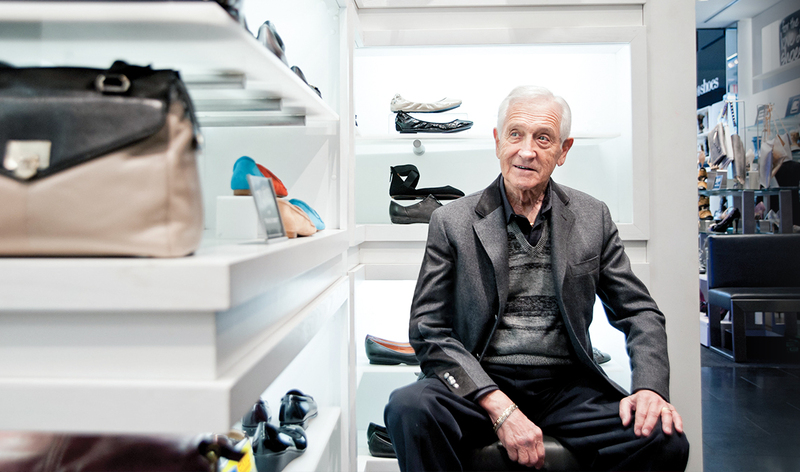 Town Shoes founder Leonard Simpson is one of more than 10,000 volunteers providing mentorship and opportunities to U of Tstudents. A successful business often begins as a struggling business. Such was the case for Leonard Simpson. After earning his BA from University College in 1950, the 22-year-old Leonard took over his family’s struggling small chain of shoe stores. He first made the difficult decision to close two of the three stores, devoting his resources and energy to making just one store a success. That single store eventually grew into Town Shoes, the largest footwear retailer in Canada. In 2012, Simpson sold his company and joined U of T’s mentorship program with the ultimate goal of bettering his community. He poured himself into his work for the University, leveraging his expertise as an entrepreneur to help students from the Faculty of Arts & Science and the Rotman School of Management chart their paths to success. He would take numerous pupils under his wing at one time, going out of his way to create opportunities for them to learn from his experience and introduce them to members of his vast network of professional contacts. While studying for his master’s degree in economics, Alex Comeau became one of Simpson’s first mentees. The student leapt at the chance to gain insight into the personal traits and decision-making frame of mind that had shaped the successful retailer’s career. In the end, it was this expert tutelage that gave Comeau the tools necessary to pursue his ambitions—in 2015 he became an analyst at RBC PH&N Investment Counsel in Montreal, advising portfolio managers on asset allocation. He credits much of his success to Simpson’s influence at a pivotal moment in his life. Simpson is part of a growing community of alumni volunteers inspired to reconnect with the University. Participation in mentorship has surged during the Boundless campaign, and thanks to alumni like Simpson, the mentorship program continues to provide invaluable support to students chasing their academic and professional dreams.